Since its creation in 1999, Allegro Choirs of Kansas City has grown from one youth choir of 38 singers to over 250 singers in six ensembles. Today, the singers represent students in grades 3 through 12. Drawn from across the Kansas City metro, these talented young singers come from private, public, and home-schooled environments. 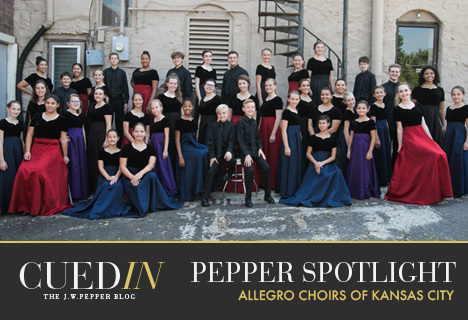 Allegro Choirs delight audience members each year – locally, nationally and abroad – with their varied repertoire and heartfelt singing and this year will enchant audiences as they perform at the ACDA National Conference in Kansas City. The Allegro singers come from a variety of backgrounds but share an important common value as the singers work together to achieve one sound: Every Individual Voice Matters. These singers are proof that “lives are changed through song” as individual character, standards, and friendships are molded for life. Every individual on the Allegro staff believes passionately in Allegro’s standard of excellence, methods of instruction, and the untapped potential of each singer who walks through the door. The Allegro staff has been hand selected so that every member brings a level of excellence and utmost professionalism to their position, combined with unbounded creativity, inspiration, and a desire to teach. Inspiration within Allegro is contagious, and the organization strives to make a difference in our community and our world. Allegro partners with foundations such as HALO as well as providing special performances for those in need, knowing that doing so not only transform the lives of the singers and directors but positively impact those around us through service, soul, and song. In addition to providing a wonderful musical environment that promotes life values, friendships, and a love of music that last a lifetime, participation in Allegro ensembles also teaches an appreciation of fine arts, self-discipline, teamwork, self-expression, confidence, skill mastery, an understanding of one’s self and how we relate to the world, respect, compassion, commitment, the ability to self-assess, emotional maturity, musicality, an understanding of diversity, community, and service, the importance of hard work, and self-esteem. Directed by Christy Elsner, this ensemble is composed of a select group of outstanding singers from Brio and Spirito. This small ensemble of high school young men and women serve as our ambassador choir in the Kansas City metro and is available for hire, performing concert sets of up to 30 minutes in length. Brillante will delight any audience with a variety of repertoire and gorgeous sound. Directed by Christy Elsner, this ensemble is recognized nationally and internationally for its exceptional technique, colorful rich tone, and artistic expression. The high-school-age ladies “wear the pearls” and come from a wide variety of backgrounds, talents and interests, but all have the same goal of singing challenging repertoire with excellence. They have graced the stage of the Myerson Symphony Hall in Dallas, Carnegie Hall in New York City, the Kauffman Performing Arts Center in Kansas City, the White House in Washington, D.C., St. Peter’s Basilica in Rome, Italy and many other incredible venues in the United States and abroad. They are featured on many recordings on the Santa Barbara Music Publishing website as well as other publishing companies. Brio offers advanced choral training and vocal development; singers learn at an intense pace. Directed by Dr. Christopher Smith, this is an energetic ensemble for young men with changed and changing voices. Spirito rehearsals are fast-paced with a focus on vocal development and musicianship skills. Spirito performs a wide variety of music from numerous styles and periods. The young men of Spirito pride themselves on being a brotherhood of first-rate showmen and positive role models. Spirito men are fiercely proud of their exceptional artistry and consistently wow audiences with their combination of power and sensitivity. Directed by Christy Elsner, this ensemble is structured for singers who have a passion for singing and a desire to perform at a higher musical level. Rehearsal techniques are innovative and learning is fast-paced with a focus on building reading skills, developing the changing voice, boosting confidence, engaging in proper vocal technique, and teamwork. Directed by Gretchen Harrison, this ensemble is for treble singers in grades 5–7. Vivo provides vocal training in an energetic, loving atmosphere. Basic theory, music reading skills, head tone, vowels, breath control, and performance skills are taught through unison and two-part music. Directed by Kellyn Harrison, this is an introductory “get your feet wet” choir for grades 3–5. Good vocal singing habits, basic performing skills, and music theory are introduced through age-appropriate classical voice training in a fun, high-energy environment. Christy Elsner – As Allegro’s founder, Christy loves standing before young singers as proof that dreams come true with hard work, elbow grease, persistence, and a passion for your chosen field. Gretchen Harrison – In addition to working with Allegro, Gretchen is currently responsible for the vibrant choral program at Frontier Trail Middle School in Olathe, Kansas. Kellyn Harrison – A singer for eight years, Kellyn has grown up in the Allegro family. She is energetic, smart, and funny, loves to sing, and plays a mean French horn. Dr. Christopher Smith – Chris brings plenty of experience as a mentor, conductor, art director, and pianist. He leads our young men with positivity and encouragement. Jamea Sale – Jamea is a singer/soloist with the William Baker Festival Singers of Kansas City and serves as associate director at Grace & Holy Trinity Cathedral. Dr. Andrea Ramsey – Dr. Andrea Ramsey enjoys an international presence as a composer, conductor, scholar, and music educator. Andrea has been composer-in-residence for Allegro for over fifteen years. Lori Egan – Serving as our administrator, Lori works hard to help educate and develop the brains and hearts of Allegro’s young singers. Repertoire of Allegro Con Brio: Dixit Dominus, Baldassare Galuppi; Sing Me to Heaven, arr. Paul Carey; Du Friedefurst, Herr Jesu Christ, arr. Jim Leininger; Ain’t No Grave Can Hold My Body Down, arr. Paul Caldwell and Sean Ivory; No Time, arr. Susan Brumfield; Fecit Potentiam, ed. Ralph Hunter; El Desdichado, Camille Saint-Saëns; Lineage, Andrea Ramsey; Nada te Turbe, Joan Szymko; They’re Red Hot, arr. Moira Smiley; A Witness to Majesty, Andrea Ramsey; Will the Circle be Unbroken, arr. J. David Moore; Lullaby from Cantata “This Day” Ralph Vaughan Williams; Mele Kalikimaka, arr. Briana Swift; Christmastide, Tom Shelton; O Come, O Come, Emmanuel, Traditional; Morokeni arr. Bernard Kruger; Nisi Dominus, ed. Kevin Padworski; Romance, Claude Debussy; Captivity, arr. Mark Herman & Ronnie Apter; Shifting the Sun, Lee Kesselman; Tha Thin Tha, Lisa Young & Ben Robertson; Hark, I Hear the Harps Eternal, arr. Alice Parker; Bright Mansions, arr. K. Lee Scott; Banjo Pickin’ Girl, arr. Andrea Ramsey & Tim Sharpe; No Hiding Place and Ride the Chariot, arr. Marilyn Epp; I Cannot Dance, Kurt Knecht; Heart, We Will Forget Him!, James Q. Mulholland; Tecum Principium, arr. Christy Elsner; Even When He Is Silent, Kim André Arnesen; Hold On, arr. Stacey V. Gibbs; Cantate Domine, Heinrich Schütz; Trillo, Traditional Swedish Folk Song; She, arr. Andrea Ramsey; Jerusalem, arr. Michael McGlynn; Let All Mortal Flesh Keep Silence, arr. Doug Claybrook; Sleigh Ride, arr. Hawley Ades.